Rampur-Sahaswan is a gharana of Hindustani classical music centred in the Uttar Pradesh towns of Rampur and Sahaswan. The history of this gharana begins with Inayat Hussain Khan (1849-1919). He was the son of Mehboob Khan, a khayal singer and Veena player of the Rampur court. Mehboob Khan is said to have performed khayals in a simple style with an emphasis on tappa style taans, which can be taken to be an indication of his affiliation to the Gwalior khayal gharana. He was also a beenkar and veena player. Inayat Hussain Khan had a cousin, Haider Khan, whose grandson was Nissar Hussain Khan (1906-1993). Inayat Hussain Khan is said to have shown unusual singing talent in his childhood and so his father took him to the chief court musician of the Rampur court for further training. So as Inayat Hussain Khan, the founder of the gharana, hailed from Sahaswan and was trained and lived in Rampur, the gharana came to be called Rampur-Sahaswan. Inayat Hussain trained his son Sabir Hussain and his son-in-law Mushtaq Hussain Khan (1874-1964). It is through the styles of his sons-in-law that contemporary experts have formed their idea of the Rampur-Sahaswan style and it is through his sons-in-law that the gharana stays aloft today. Like the sons-in-law, Inayat Hussain’s three daughters, naturally played a big role in keeping the gharana alive. The youngest daughter Sabri Begum gave birth to leading senior contemporary exponent Ghulam Mustafa Khan and daughter Shakhri Begum. Shakhri Begum gave birth to Rashid Khan, the famous vocalist. The renowned singers of this gharana include Mushtaq Hussain Khan, Nissar Hussain Khan, Ghulam Mustafa Khan, Ghulam Sadiq Khan, Rashid Khan, Ghulam Abbas Khan, Begum Shanno Khurana and Sulochana Brahaspati. Like it or not, here I come once again with a few songs of my choice. These songs have been part of my collection ever since I started appreciating classical music. And I am not talking about ancient history. I guess it happened 3 years ago. I hope you’ll enjoy the songs. Most connoisseurs of art feel this strong urge to display their own preferences and taste in that particular art form. Almost everytime, deep inside them, they wish to see nods of approval from others, that their taste is indeed perfect and deserving of a true evaluator. 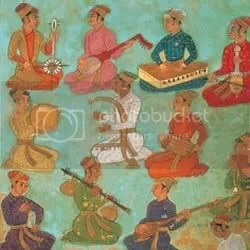 Here are some more gems from my favourite playlist of Hindustani classical music, subject to your nods ..and nudges, of course. No festival of India is such an important constituent of our traditional classical and folk music as Holi. This festival of colors, is one that adorns our lives with the synergy of celebrative air and music. This joyous festival is in tune with the gaiety of the spring season when this festival is held. The windswept, withering, winter scene is truly dabbed away with the vibrant colors of blossoming flowers heralding spring, a time for the earth to rejuvenate. The refreshing southern breeze successfully chases out the chilly northern wind, in the Hindu month of ‘Phalgun‘. The fervor, fun and frolic of the festival reflect the essence of harvest and hope. Endowed with an exceptionally melodious and sensitively adaptable voice, Ghulam Mustafa Khan‘s music gives witness to the rigorous traditional training that he received from his distinguished gurus. He hails from a family steeped in North Indian Classical vocal music culture, his forefathers being some of the most prized court musicians honoured and celebrated by the Kings and Maharajas in a musical lineage that goes back to more than 150 years. Ghulam Mustafa Khan has brought these traditions into the present with great effect, and added his own personal traits. 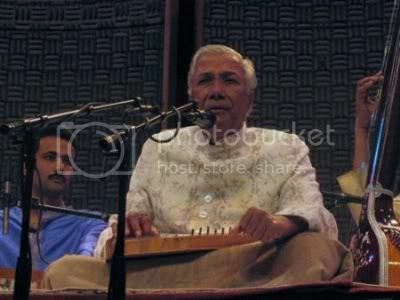 Born over seven decades ago, on March 3, 1931, in the Badayun city of Uttar Pradesh, Ghulam Mustafa Khan was initiated into music by his father, Ustad Waris Hussain Khan. Later he was groomed under Ustad Fida Hussain Khan, and then later his son Nissar Hussain Khan. Ghulam Mustafa Khan belongs to an illustrious school of music known as ‘Sahaswan Rampur Gharana‘. This Gharana has produced an abundance of khayal singers since the time of its founder Ustad Inayat Hussain Khan (1849-1919). Khayal, in Urdu meaning imagination, is the most popular genre of North Indian classical vocal music, designed to give the singer optimum scope for improvisation. Originating in the courts of the Moghul emperors as a less rigid alternative to the Dhrupad style, it has evolved into a remarkably flexible form that allows an artist’s individuality considerable rein. Even within the past five decades the form has undergone many changes, and the tradition of innovation continues through pioneers like Ghulam Mustafa Khan. Khayal has several schools following different style traditions. Most of these Gharanas have been built around certain families or specific locations like Gwalior and Rampur. Gharanas traditionally followed the Guru-Shishya system of instruction in which direct, one-on-one teaching and personal supervision meant a clearer and therefore deeper understanding, of both the traditions of that Gharana, of the raga, and of the role of a particular style in exploring and presenting that raga. As Inayat Hussain, the founder of the gharana, hailed from Sahaswan and was trained and lived in Rampur, this gharana came to be called Rampur Sahaswan. It’s always been a struggle for khayal singers to establish themselves on the world music scene, because of the barrier of language. In fact, the lyrical content of the khayal while certainly enhancing the beauty of the presentation is regarded as secondary to the ability of the performer to improvise within the framework of the specific raga. The emphasis on lyrical content varies from artist to artist, many of the texts of khayal are written in an ancient form of Hindi known as Brij Bhasha. Khayal has also had a profound influence on instrumental music. 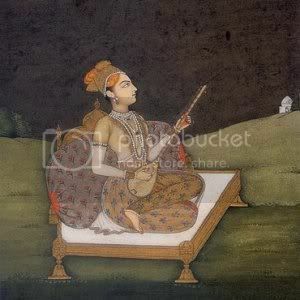 Many instrumentalists point out that Indian music IS vocal music, and that the instrument should sing in the style of khayal. Ghulam Mustafa Khan’s contribution goes beyond his own performance. He has trained and moulded some of India’s finest film singers including Manna Dey, Sonu Nigam and Hariharan. He was awarded the Padma Shree in 1991 by the Indian Government in recognition of his service to Indian music heritage.